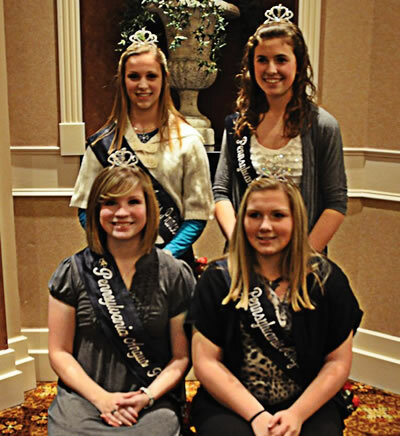 These young ladies were recognized as Pennsylvania Angus royalty at the 2012 Pennsylvania Angus Association Annual Meeting and Banquet, Jan. 8 in Harrisburg, Pa. Pictured seated from left are Amanda Cole, Bentleyville, Sweetheart, Kate Livingston, Dover, Queen; Madison Weaver, Ephrata, Sweetheart; Princesses pictured standing from left are Ruby Monn, Shippensburg; Andrea Foore, Sev-en Valleys; Rachel McKean, Mercer; Alexis Cash, York; Shelby Dean, New Castle; Claudia Hissong, Greencastle. These young ladies were recognized as Pennsylvania Junior Angus officer team at the 2012 Pennsylva-nia Angus Association Annual Meeting and Banquet, Jan. 8 in Harrisburg, Pa. Pictured seated from left are Andrea Foore, Seven Valleys, President; Shelby Dean, New Castle, Vice President. Pictured stand-ing from left are Claudia Hissong, Greencastle, Treasurer; Alexis Cash, York, Secretary. 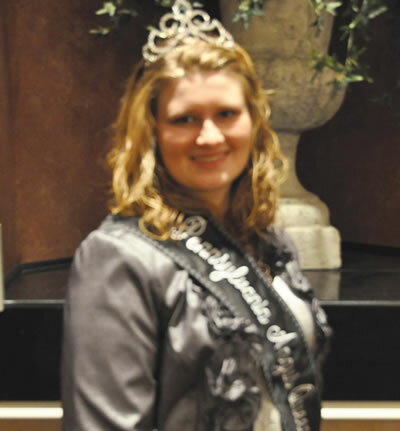 Kate Livingston, Dover, was crowned Pennsylvania Angus queen at the 2012 Pennsylvania Angus As-sociation Annual Meeting and Banquet, Jan. 8 in Harrisburg, Pa. The Pennsylvania Junior Angus Association presented Andrea Foore, Seven Valleys, left. 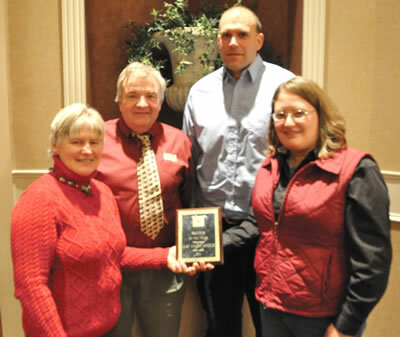 with the Pennsylvania 2011 Outstanding Girl award at the 2012 Pennsylvania Angus Association Annual Meeting and Banquet, Jan. 8 in Harrisburg, Pa. Pictured presenting the award is Fritz Frey, Pennsylva-nia Junior Angus Association advisor. 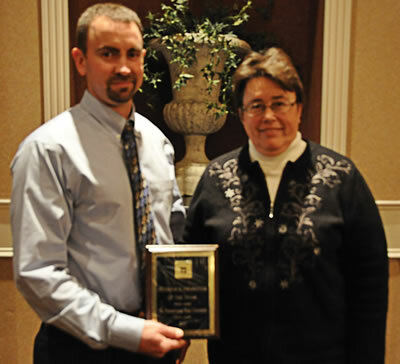 Penn State University, State College, Pa., was named 2011 Seedstock Producer of the Year at the 2012 Pennsylvania Angus Association Annual Meeting and Banquet, Jan. 8 in Harrisburg, Pa. Pictured presenting the award is Cheryl Fairbairn, Pennsylvania Angus Association president, right, Wendall Landis, herdsman accepted the award, left. 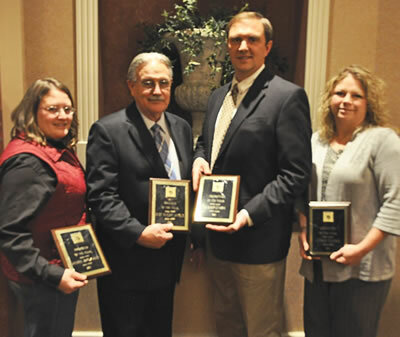 Jamie Brozman, Nazareth; Larry Weaver, New Holland; Chad Cash, York; and Chris Foore, Seven Val-leys, were named 2011 Promoter of the Year at the 2012 Pennsylvania Angus Association Annual Meeting and Banquet, Jan. 8 in Harrisburg, Pa.
Just Enuff Angus, Nazareth, was named the 2011 Pennsylvania Angus Association's breeder of the year at the 2012 Pennsylvania Angus Association Annual Meeting and Banquet, January 8 in Grantville, Pa. Accepting the award from left is Linda Hower, Ned Hower, Gerald Brozman, and Jamie Brozman. 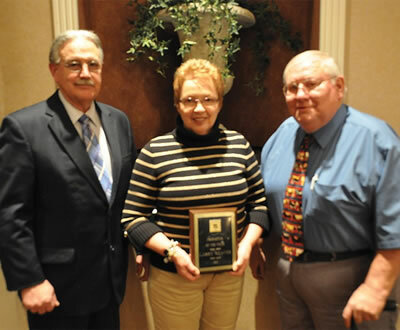 Barbara and Larry Weaver, New Holland, Pa., left, were named 2011 Pennsylvania Family of the Year at the 2012 Pennsylvania Angus Association Annual Meeting and Banquet, Jan. 8 in Harrisburg, Pa. Pictured presenting the award is Bob Hay, Friedens. Standing left to right Tim Spangler, Boswell; Wendall Landis, Manheim; Gene Nolt, New Holland; Gene Trowbridge, Meshoppen; Fritz Frey, Quarryville; Dale Rains, Mercer. 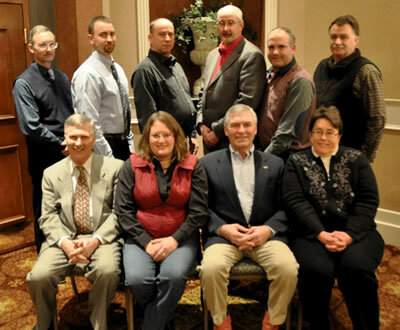 Seated left to right Brad Bishard, York, Treasurer; Jamie Brozman, Nazareth, Secretary; Erskine Cash, Centre Hall, Vice President; Cheryl Fairbairn, Coatsville, President.